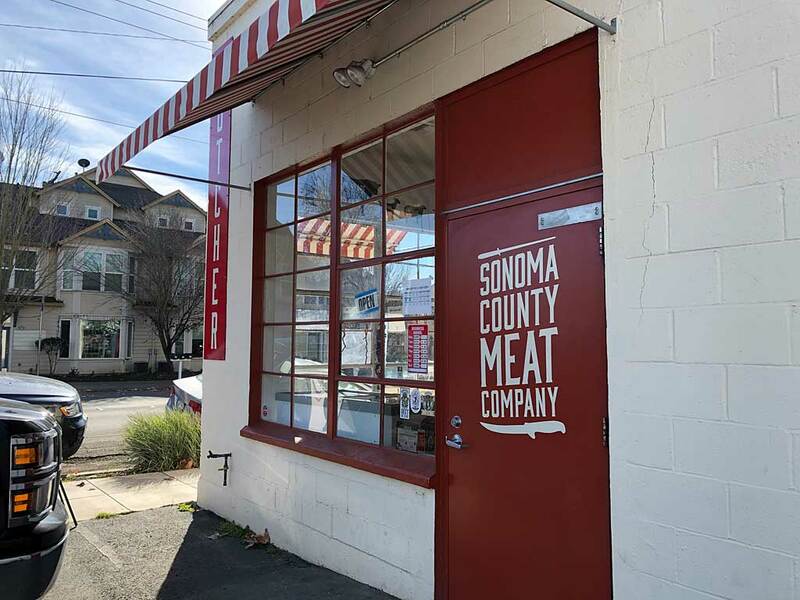 California > Santa Rosa: Sonoma County Meat Co.
Thread: California > Santa Rosa: Sonoma County Meat Co.
Not a barbecue restaurant, but a good source for local, high-quality meat for barbecuing and grilling. 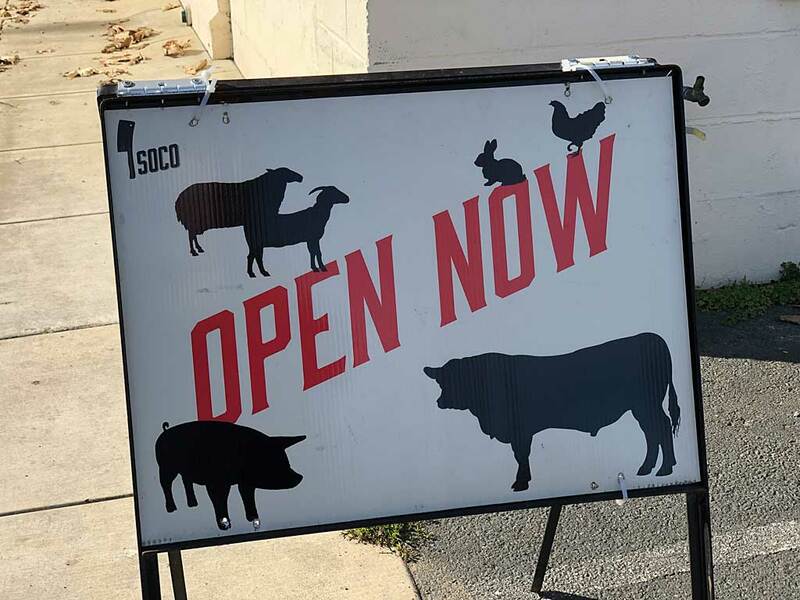 I had purchased SoCo bacon at Oliver's Market in Cotati on several occasions, but made my first visit to the SoCo butcher shop itself on December 29. 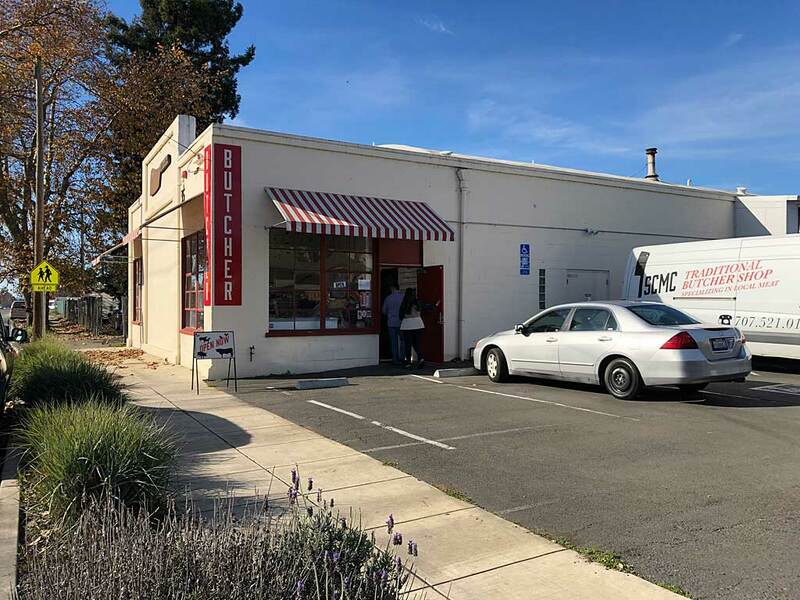 It's a little retail storefront set into the corner of a smallish building in the southwest corner of Highways 101 and 12 in downtown Santa Rosa. 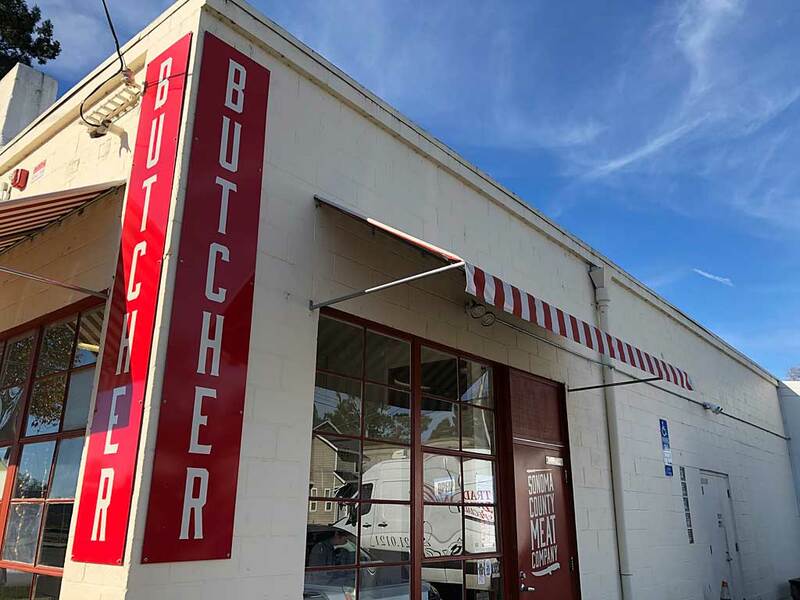 Look for the bright red "Butcher" signs and the red front door. 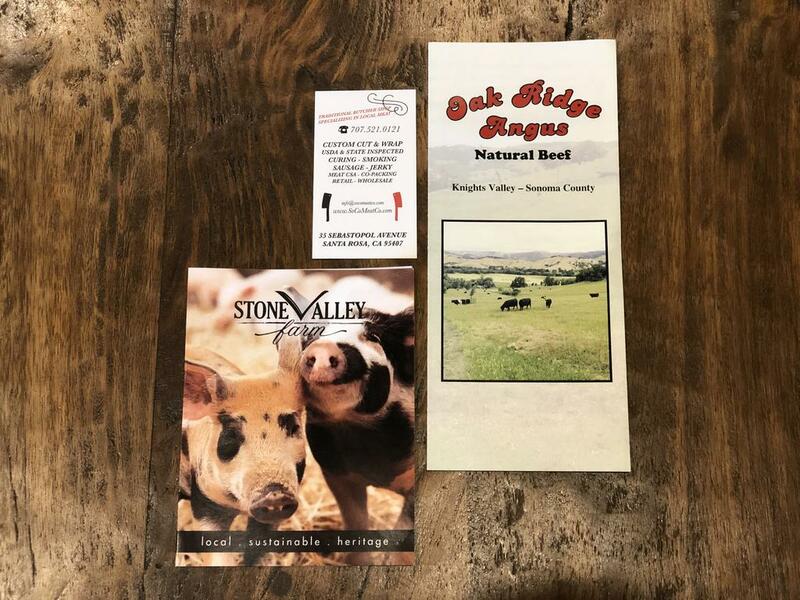 Inside you'll find a single glass display counter chock-full of various cuts of fresh meat (a few cuts of dry-aged beef are available), topped with a beef jerky display, and on the other side of the room a chest freezer filled with frozen steaks, sausages, and more. 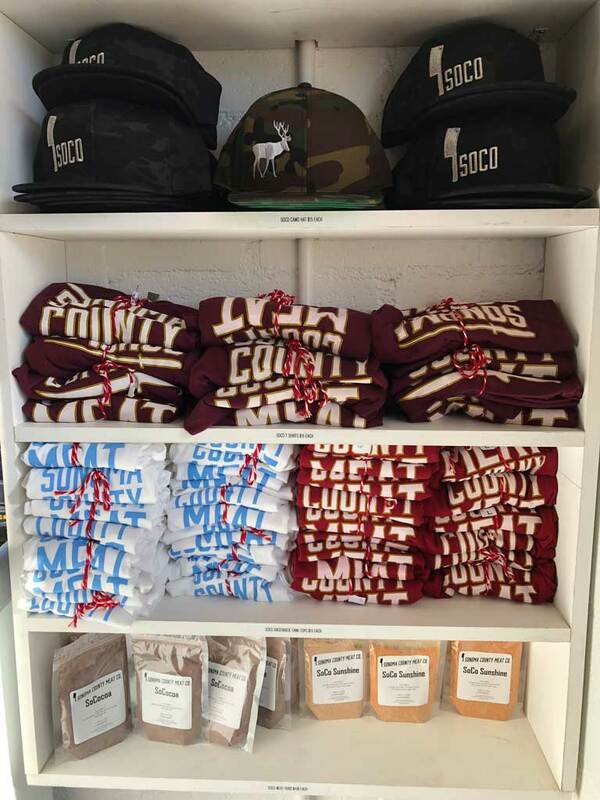 Add a shelf of t-shirts and baseball caps and a cash register and you've pretty much seen everything there is to see at SoCo. 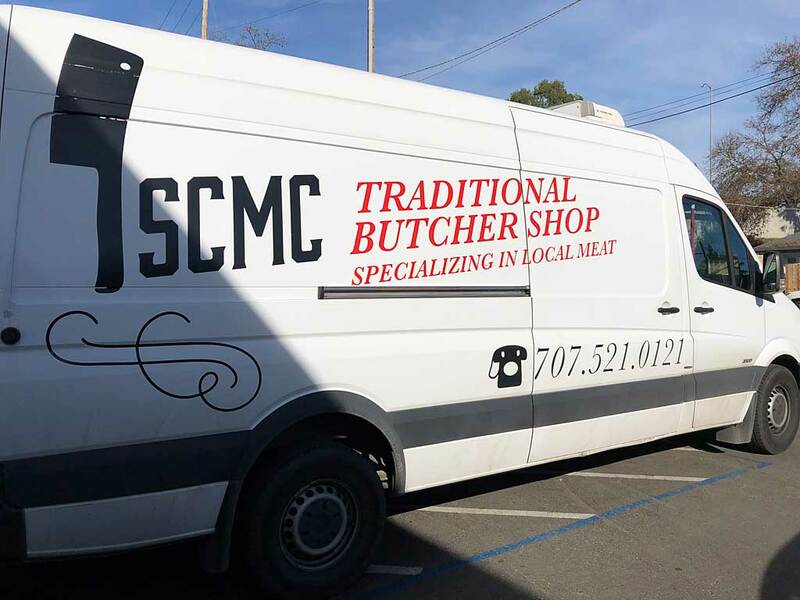 Well, except for the interesting display of antique butcher knives/saws that covers an entire wall and the meat charts and signage and artwork covering the rest of the place. 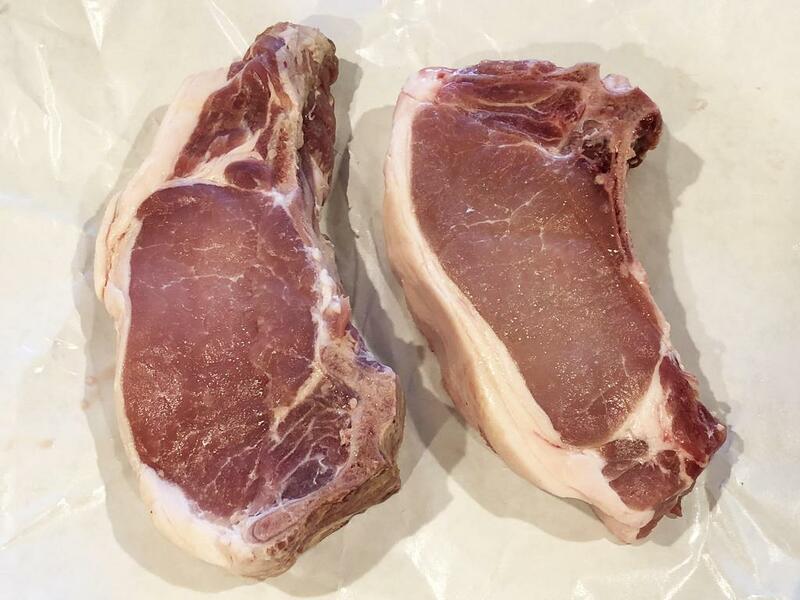 I bought a pound of the classic-flavor bacon, a pound of applewood bacon, some beef jerky (slightly soft, really delicious), and two thick heritage breed pork chops that I'll cook on New Year's Eve. 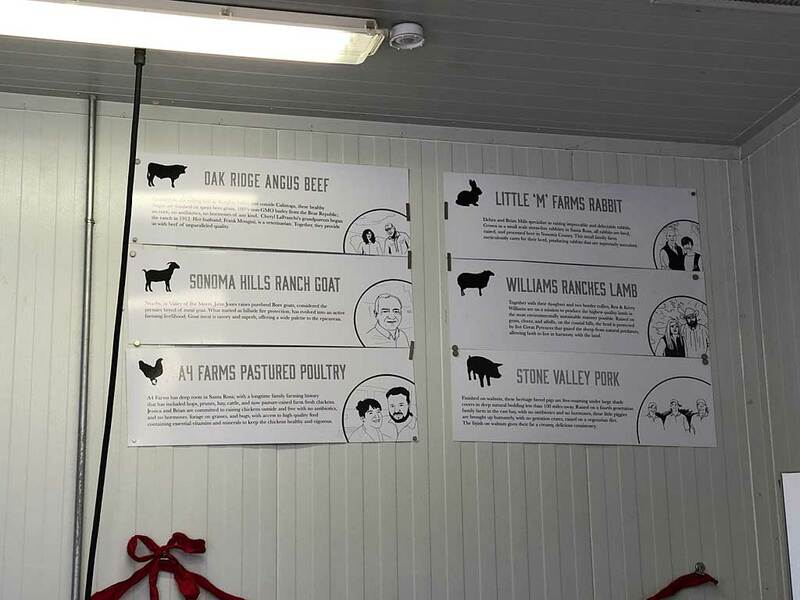 All meat is locally sourced, and there are posters on the wall listing the names and details of each supplier for their beef, pork, goat, poultry, etc. Friendly and helpful staff were on-hand. 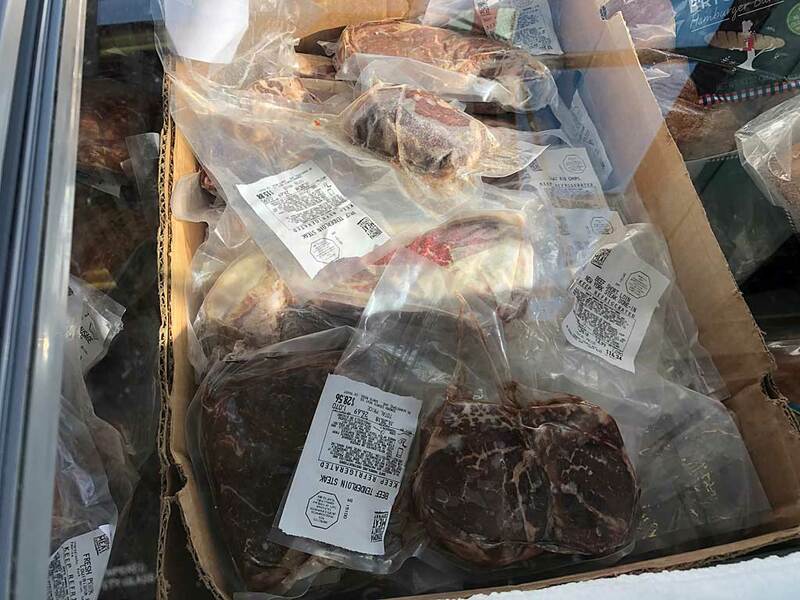 Besides retail sales, SoCo offers custom meat cutting and wrapping, meat shares, a meat CSA (Community Supported Agriculture) program, and more. Can't find what you're looking for? Just ask. While I was there, a young man walked in and asked if they had pork shoulder. 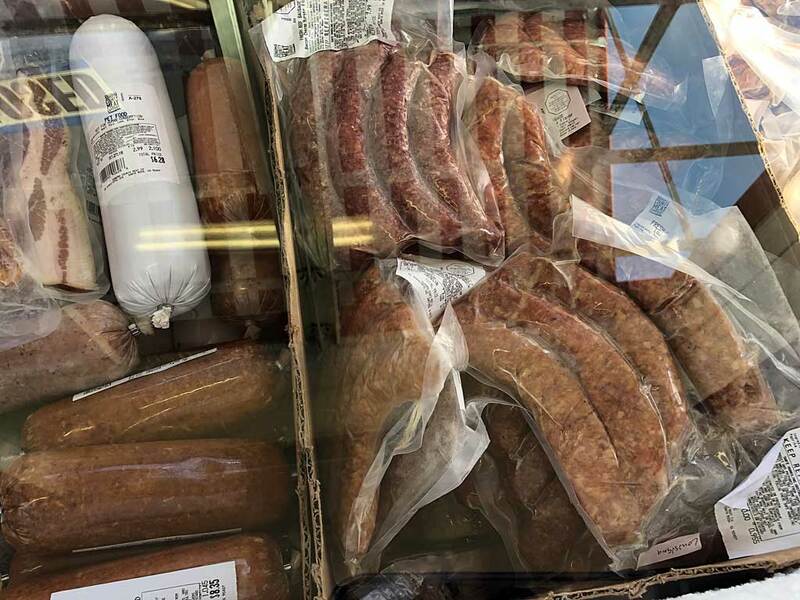 "How many pounds do you want," said the butcher, "we'll cut it right here," motioning to the quarter hog laying on the back counter. "Five or six pounds?" said the young man. Zip, zip, zip, and there was a freshly-cut chunk of bone-in pork shoulder on the scale, ready to go home for barbecuing. It doesn't get any better than that! Great place! I hope you'll visit if you have a chance. Here are some photos I took...enjoy! Notice the giant meat cleaver? 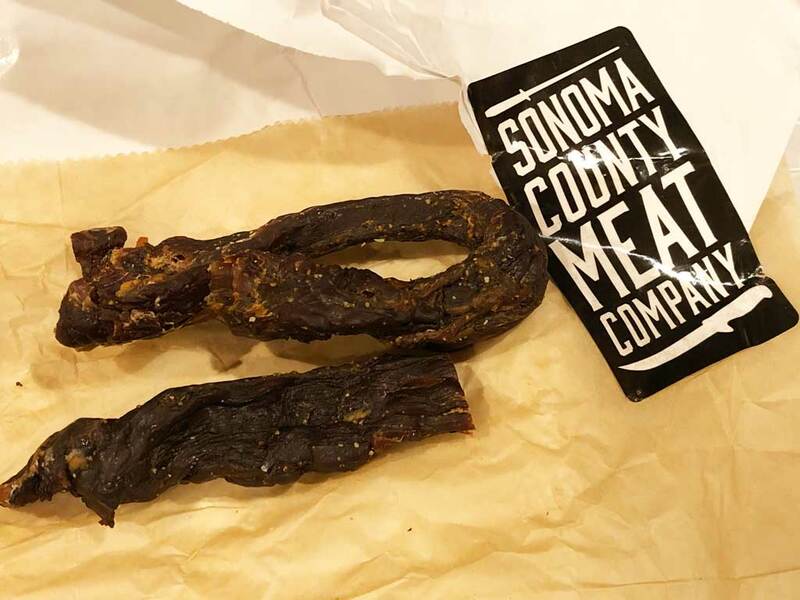 Here's what's left of the jerky I bought. Very tasty, meaty, slightly moist texture. I'll go back for more of that in the future. 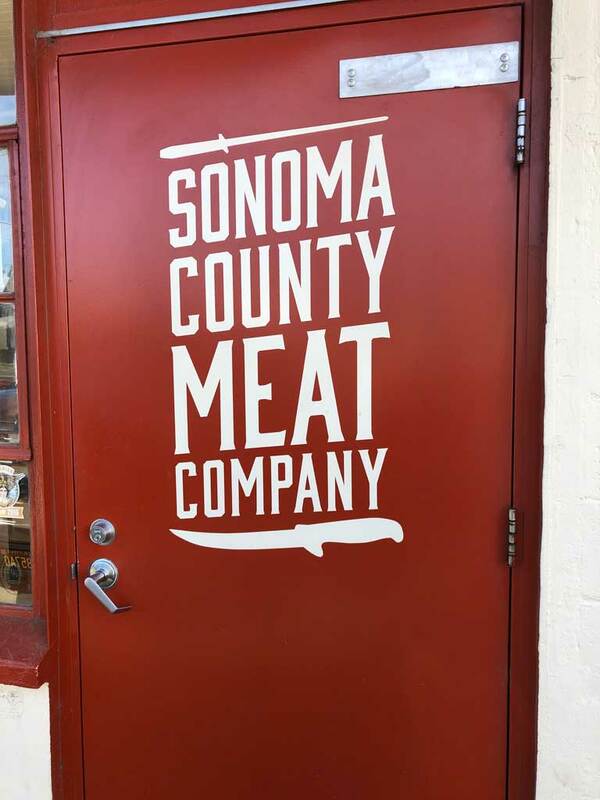 We were in the Bay Area recently and I wanted to check out the Sonoma County Meat Company. after viewing Chris's post. 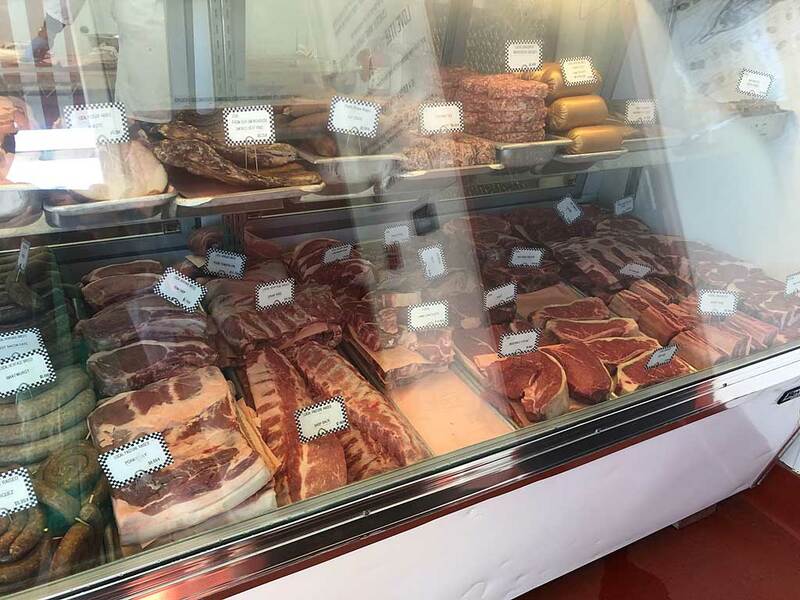 We spent around 20 minutes looking at the meat and talking to the employees. We had a really fun time and it was worth the trip up to Santa Rosa. 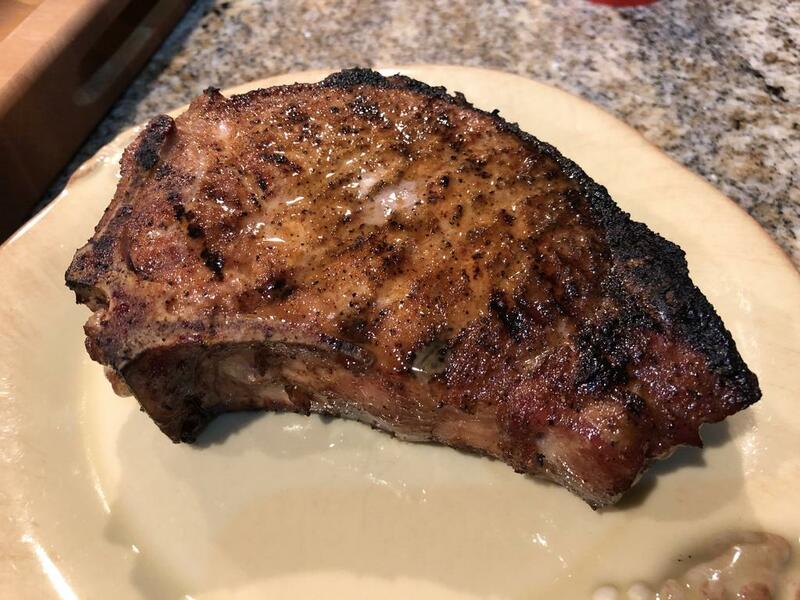 We purchased a couple of heritage pork chops, around an inch and a half thick. I wanted a couple of these Wagyu Rib Eyes but I just couldn't pull the trigger on $39.99/lb. Maybe next trip. We'd just had a huge, late lunch and were traveling home the next day so I froze our chops as I knew we wouldn't have the appetite for our dinner. I'll grill these in a week or two and post the cook. Last edited by Cliff Bartlett; 02-09-2019 at 01:02 PM. Oh yeah, you'll enjoy those pork chops! Glad you were able to visit.